These offices are the corporate headquarters for a young company, iCreate, which is develping new technology for concrete. Felderman Keatinge & Associates (FKA) objective was to design a Think Tank that would encourage interaction and reflect the innovative green products that they are developing. FKA’s challenge was to design a space that was a showroom for product, but also functioned as a working office. By justaposing sculptural and refined architectural elements against the exposed mechanical system and raw concrete flooring, Felerman Keatinge & Associates were able to create a space that expresses the “quality and raw” nature of their products. Felerman Keatinge & Associates created an open, fluid and minimalist space that became a blank slate for interaction of employees and fostering innovative thinking. Upon entering the space, the visitor is brought directly in to the centre of the “hub”, interacting and immediately becoming a part of the group. 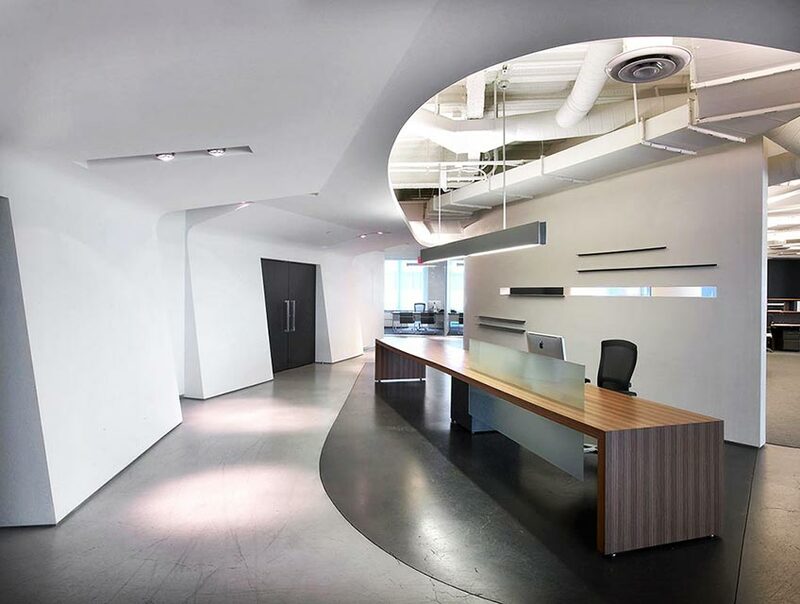 Rather than a traditional reception desk and waiting area, a long work surface was designed to provide layout space for the company’s products and function as a conference table. Custom designed workstations were fabricated that responded to the employee’s needs and ability to interact with one another. This approach proved to be both cost-effective and an intelligent response to a specific design challenge. Throughout the process, Felerman Keatinge & Associates supported the client’s vision. A key challenge of any project is to always be insightful to the design vision, while maintaining a resourceful and imaginative eye on the budget.